Saturday afternoon my wife and I took a drive to one of our favorite places. Its a lovely stream that flows through a beautiful hemlock and oak forest. The woods were cool except where the sun was able to break through. 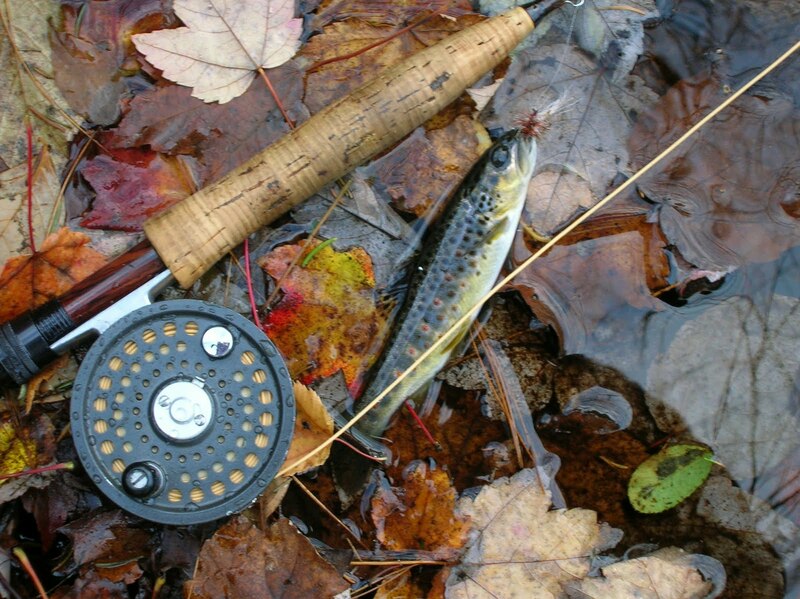 Just to walk along its banks is pleasure enough, but to have a fly rod in hand is heaven. I tied on a Bomber and began running it down the riffles and runs, with the thought of a brookie rising quickly to the fly. But after many attempts I soon realized that the fish were not looking up. 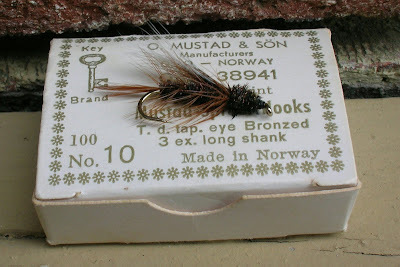 I opened my box and selected a wet fly, one of only a few I carry. A "Picket Pin". Several casts into the stream soon led me to believe it was a good decision. 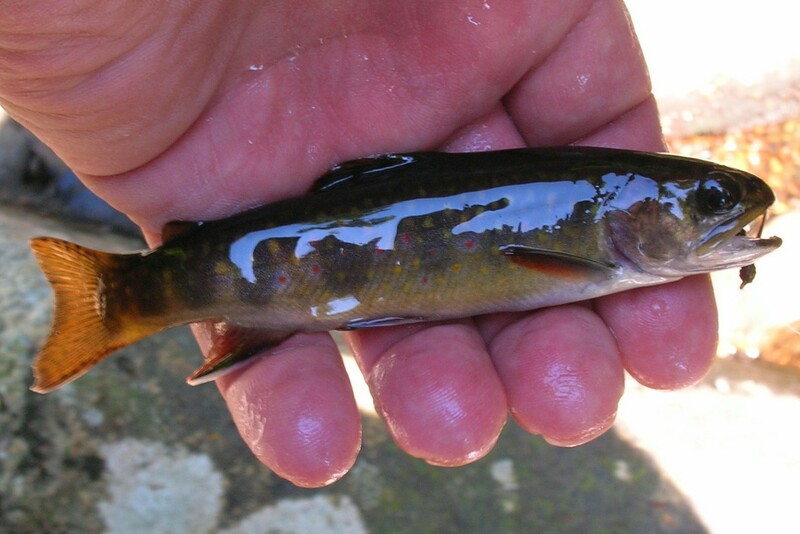 The wild brookies in this stream gave me a wonderful afternoon. Their beauty as well as the place they call home made this Saturday afternoon special. 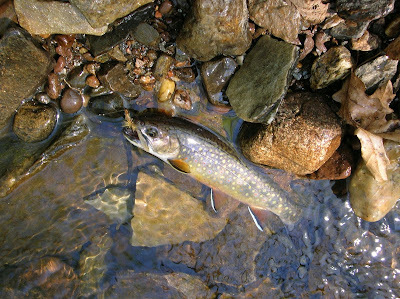 The brookies showed a preferance for a wet fly,"Picket Pin"
A welcomed and refreshing time. There are many forms of tribute, monuments, statues, and writings, some with lots of words and some with few. We are approaching the anniversary of the passing of Fran Betters. And while the tributes to him came forth, this one seemed to be the best. A fly fisher has placed a single fly that was tied by Fran, and placed it all by itself on a cap that he wears. In my opinion thats a tribute from the heart. Autumn has always been a special time of year for me. With the day's becoming shorter, the crisp days and cool nights, where hot coffee seems to have a better taste. There are the days when a flannel shirt feels oh so good. The streams and the woods are changing, colors are brilliant, the water becomes so clear, as if its trying to show the trout where to spawn. The trout take on their fall colors and are as beautiful as the countryside. The brook trout will take a bright streamer, which is one of my favorite ways to fish in the fall. The calandar still says summer, but my thoughts are of autumn. While posting some of my streamers on "smallstreams.com", I noticed a fly tyer from England who was tying and posting his creations on the same forum. His name is Roy Christie. 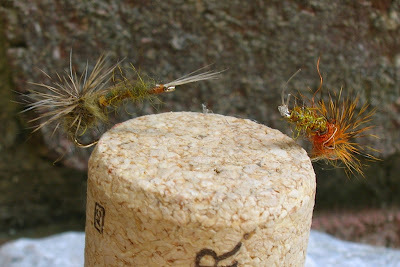 I became very interested in his reversed tied emergers, they were some of the most beautiful, and delicately tied flies I've ever seen. I emailed him and we had some conversations about his emergers, and I requested a variety of patterns and sizes. Within a few weeks the flies arrived. Upon opening the box they were sent in, I noticed that they were even nicer than the photos. Delicate and detailed insect reporductions. Saying to myself do I fish them or do I put them into my collection, well half went into the collection and the others to the stream. They are truly trout producers. 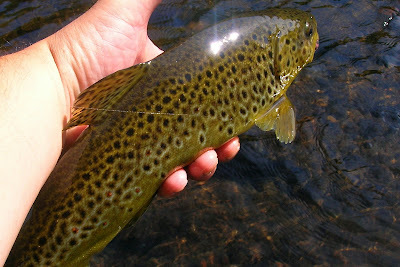 The other day while fishing the Farmington, there were trout rising to what I don't know, I'm not a hatch matcher guy and will fish what I think will work. What I was throwing was not being eaten, looking into my fly box I pulled out one of Roy's emergers and tied it on and sent it drifting over the area of rising fish. "Wham" it worked and produced three beautiful browns that morning. 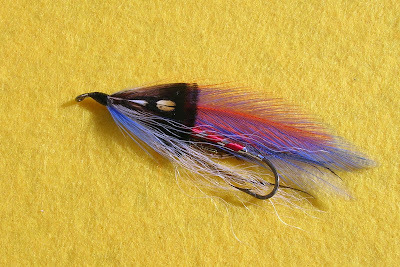 Some streamers are tied very colorful and flashy, Attractors, to get a gamefish to strike at it. The Picket Pin, fished as a wet fly has been productive on trout, landlocked salmon, and panfish. 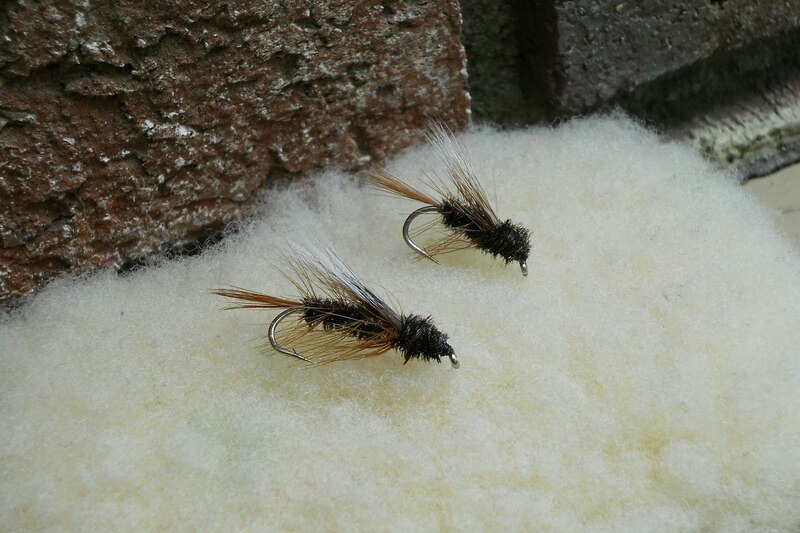 I tie it in several sizes, but I like it in size 14 best. This fly has been around for a long time. I have carried it for many years and fish it often. The results I have obtained when fishing this fly makes me say to myself, why don't you fish it more. It all starts with fresh ripe native tomatos, they are peeled and cored. Then they are diced put into a pot with onions, garlic, the best olive oil and seasoned, allowed to cook until you can't stand it any more and you dig in. If there is a plus side to the heat and humidity its got to be the bounty of tomatos. Over the last few weeks I have visited a local farm and have been buying and enjoying these beauties. As an Italian I've probably have more ways of preparing the tomato then there are weeks in the year. Here are a few. 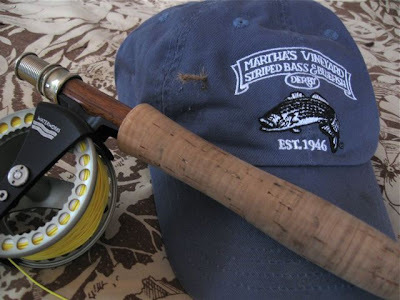 The Orvis, "Small Stream Special"
I don't know if you could call this a product report, for I have been fishing this rod for 20 years. 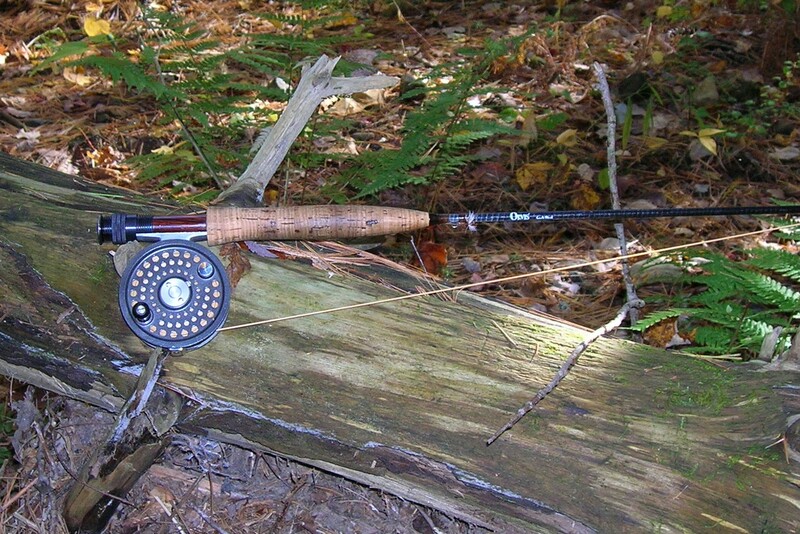 But here are my thought's on this small stream fly rod. The Orvis Superfine" Small Stream Special"
I purchased my first one in 1990 and it has been my number one rod for the small streams I fish. It's a 7ft 5wt Full Flex that rollcasts beautifully. Coupled with an English made Battenkill 5/6 reel, it's not only a great combination to fish with, it's very handsome too. I saw these guys in a stream that leads to the swamp. Monday night I pulled out a map of south west Massachusetts, looking for some blue lines that might hold some water, which perhaps = native char. Finding a few prospects and highlighting them. I headed off on Wed. to check them out first hand. An hour and a half later I pulled off the dirt road into a small parking area. While assembling my gear I could feel the warm sticky breeze coming from the forest, lots of sweat today, saying to myself. I started walking into the woods, knowing the stream I had selected to prospect was about a half mile in. The walk was gentle, sloping downward toward the stream. There were lots of sights along the way to view, woodland critters, toads, mushrooms, and a few very old foundations from years past. As I got closer to the stream I could hear the sound of water rolling over the rocks, and could feel the breeze now somewhat cooler. When I reached the waters edge, I put down the small pack and retrieved the stream thermometer and tossed into the creek. Afer a minute I took a look at the temp 70 degrees, walking along the stream I came upon several deeper runs and a few nice pools, checking the temps they were still to warm to fish. In my attempts to check the stream temps I did spook several trout. I did not fish this stream but did take several hours walking along it and taking notes..
By this time the heat and humidity were starting to take a toll on me. I had already drank several bottles of water, and my shirt and hat were quite wet. I decieded to walk back out. This is a stream I plan to return to, perhaps in the fall. When I reached the car I had a good sweat going, I grabbed a thermos full of iced tea and took a big drink, consuming half of it before breaking down the rod, and storing my gear. While doing this a truck pulled up, the driver said, Hi, I returned the greeting and we then had an informative chat. He had given me an address, and a hand drawn map to a beaver pond/swamp, not to far from where we were. He said it was a brookie hideout that needed a so called short jaunt through a swamp, but worth the effort. I thanked him for the info, and before I left I drove to where I would start my walk to the pond. Needless to say it was not going to be done this day. 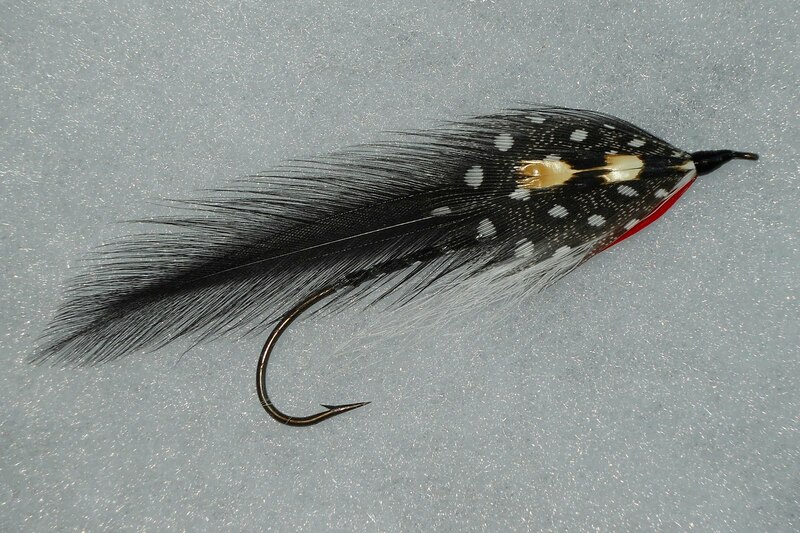 But it is now on the list of "Berkshire Bushwhacks"
Several years ago I tied a streamer fly using mostly black as the basic color. Upon completion of the streamer it had in my opinion a very intimitating look to it. So the name was given to the fly, "Intimidator"
We have been going to Maine each September for years, staying at a camp on Rangeley Lake. The camp owners are wonderful hosts and I had given them two streamers mounted in a glass display, and one of the streamers was the Intimidator. 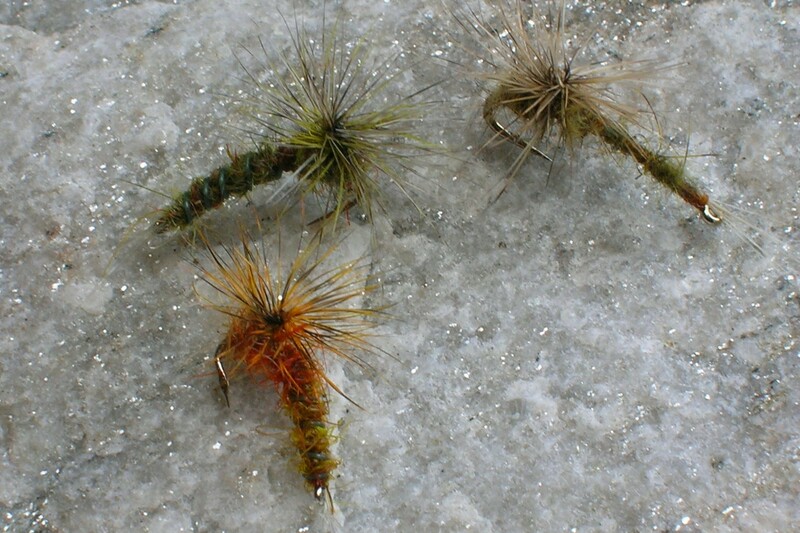 the ski trails after the names of streamer flies, Rangeley, Maine being home to many great streamer flies, and tyers. The GM who also tied streamers saw the Intimidator on the forum, he contacted me and asked if I was the originator of the streamer, to which I responded yes. He wanted to use the streamers name on one of Saddleback's ski trails. I gave him permission and told him he could see the fly at the owners camp in Rangeley. After he visited and saw the fly first hand they went with the plan to use it. A painted "Intimidator" streamer fly now shows the way along a ski trail on Saddleback, Rangeley Maine.